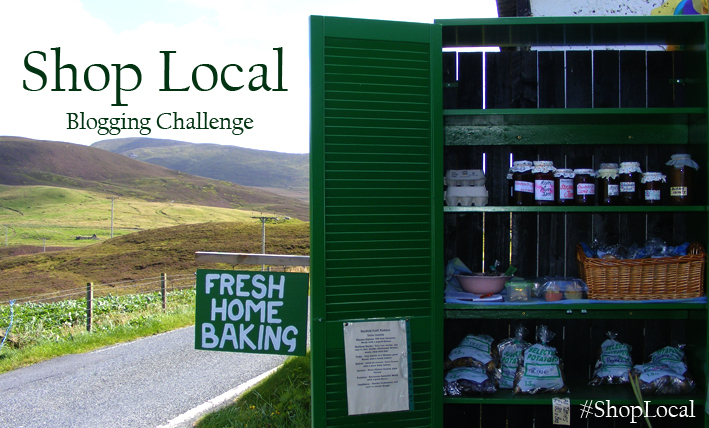 Jane of The Hedgecombers has taken on the role of co-hosting Tea Time Treats with Karen of Lavender and Lovage, and for her first challenge, she chose eggs as the theme. Surprisingly, it took me a long time to figure out what I was going to make, considering that it’s harder to find recipes without eggs than with them. It’s just that there were so many directions I could have taken, I had a difficult time making up my mind. I could do either savory or sweet. I could choose to make an actual egg dish, or one where eggs played a more subtle, background role. I even toyed with the idea of an elaborate composed dessert, using the whites for a meringue and the yolks for a custard, but a busy schedule forced that concept out of the running. In the end, I decided that I wanted to make a dish that would showcase the binding power of eggs. Eggs are so useful when it comes to holding a dish together—they don’t even have to necessarily contribute any flavour to be an integral part of dish. Eggs are, so to speak, the duct tape of the culinary world. This recipe is one of my favourites that utilizes eggs’ cementing properties. It comes from Nikki and David Goldbeck’s American Wholefoods Cuisine, which was the first “health food” cookbook I ever read. But it is the proper sort of health food cookbook, one full of all sorts of delicious recipes that also just happen to be made with wholesome ingredients. 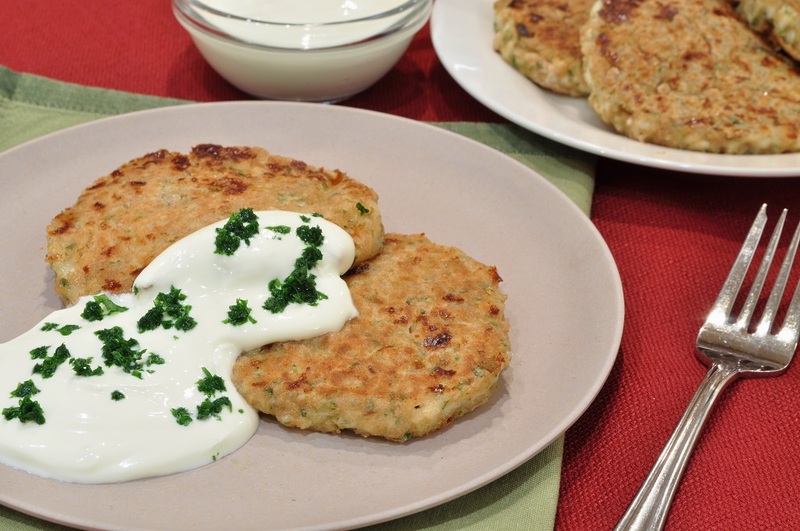 Besides being healthy and delicious, these cottage cheese cutlets are extremely quick, making them ideal for a weekday dinner. The Goldbecks suggest eating them either with tomato sauce and parmesan or yogurt and dill. As you can see by the pictures, I had them with yogurt this time, but I prefer them with tomato sauce (and Asiago cheese). And I warn you, this is a recipe that, after you’ve made it once, you’ll find yourself wanting to make it again and again. And since it’s “health food,” why not? As the eggs I used were from my local Pennsylvania Dutch market, I am also submitting this recipe to the Shop Local challenge hosted by Elizabeth of Elizabeth’s Kitchen Diary. 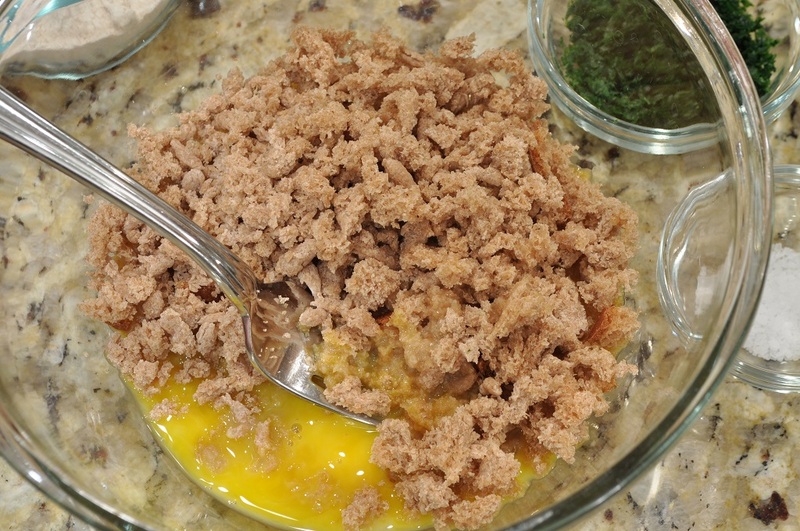 In a medium bowl, lightly beat the eggs with a fork, and then crumble in the two slices of bread. 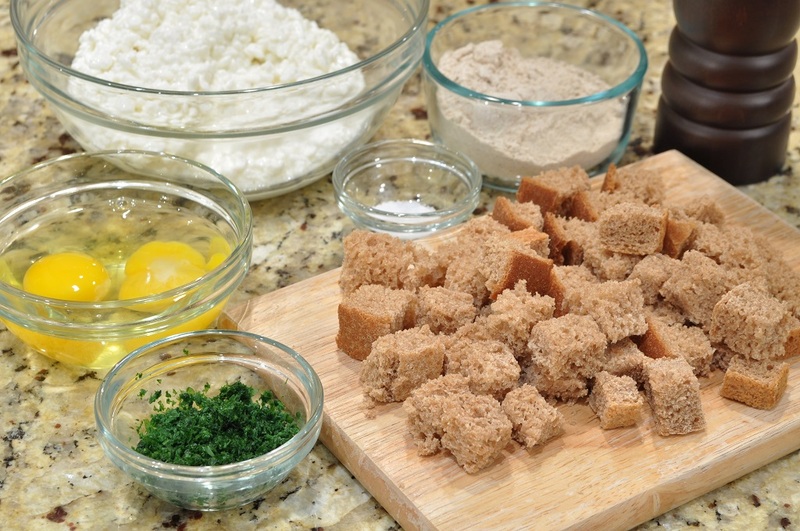 Stir well to moisten, and let the mixture stand for a few minutes to allow the bread to soften. 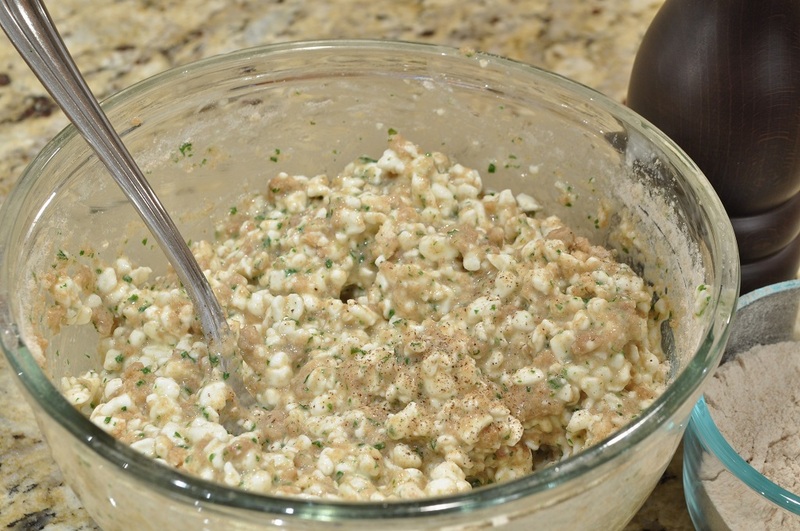 Stir in the cottage cheese, salt, parsley, and half of the flour. Spread the remaining ¼ cup of flour out on a plate. 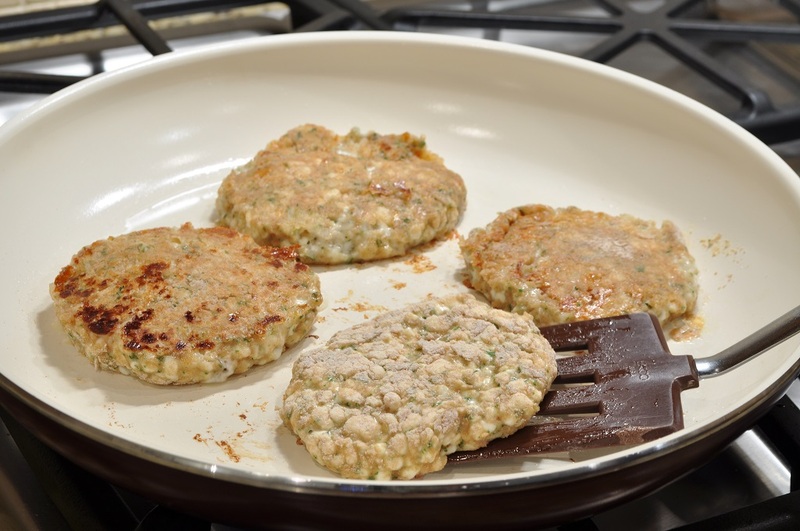 Divide the cottage cheese mixture into 8 equal portions and shape them into round patties about ½-inch thick and 3 ½ inches in diameter. 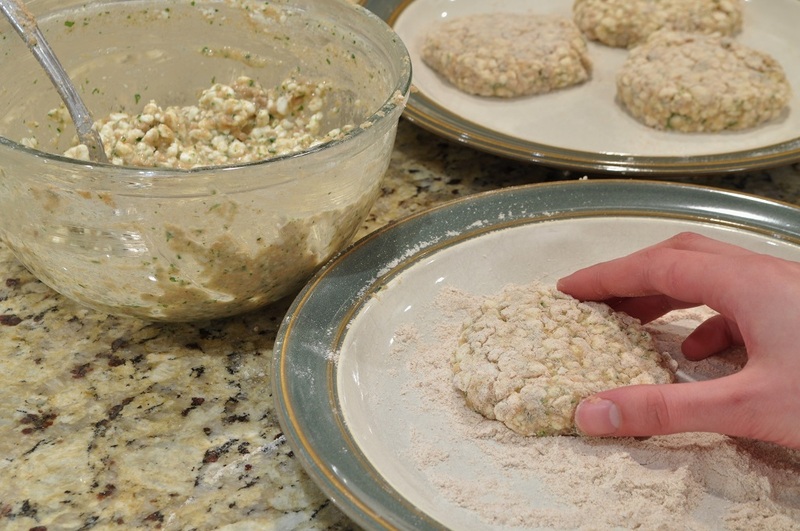 Dredge both sides of each patty in the flour on the plate. Heat a few tablespoons of oil in a large frying pan over medium-high heat. Place the cutlets in the pan and turn down the heat to medium. Cook until well-browned on both sides. 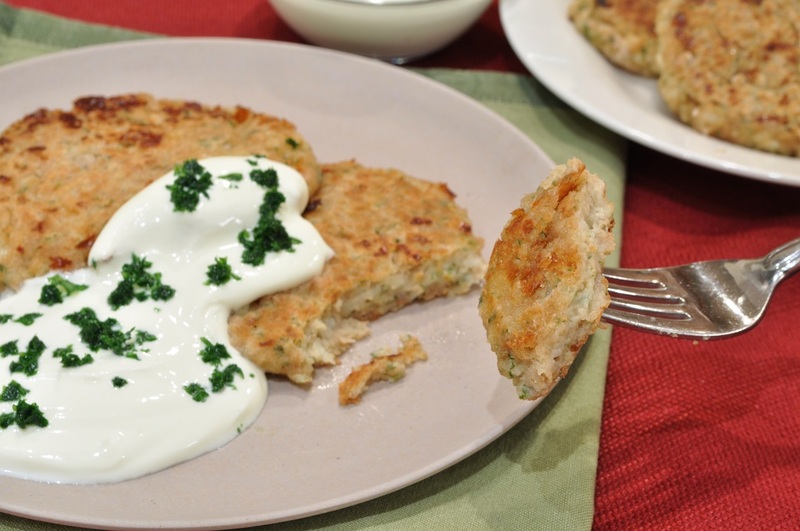 Serve hot, either Italian style with tomato sauce and cheese, or Russian style with yogurt and dill. They look like a fabulous idea, and perfect mid week tea as they are so quick to throw together. 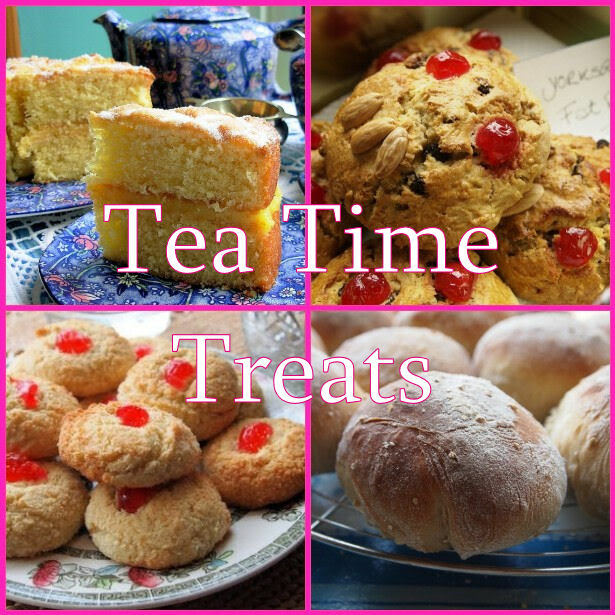 Thanks so much for linking them up to tea Time Treats, and hope to see you next time! Thanks for squeezing me in! Amazing round-up–I’ve just finished reading it. I think everyone really enjoyed the egg theme. Isn’t it Saturday yet, so I can learn next month’s theme . . . Which I guess means Karen will have to pick something really hard for next month! Just to keep us on our toes. You certainly could! I want to try making them with thyme and Dijon mustard–a favourite combination of mine. I think an Indian variation with curry would be delightful as well.